We saw the Bravo at 503 West Side Ave in Jersey City yesterday. Let's head about 3/4 of a mile north to the Fine Fare at 759 West Side Ave. This was the state of the West Side Fine Fare for many years until independent supermarket owner Mike Ayesh and his team came in. Like the Bravo, this store was gutted and outfitted with the latest decor and fixtures. West Side Ave is a busy retail district. 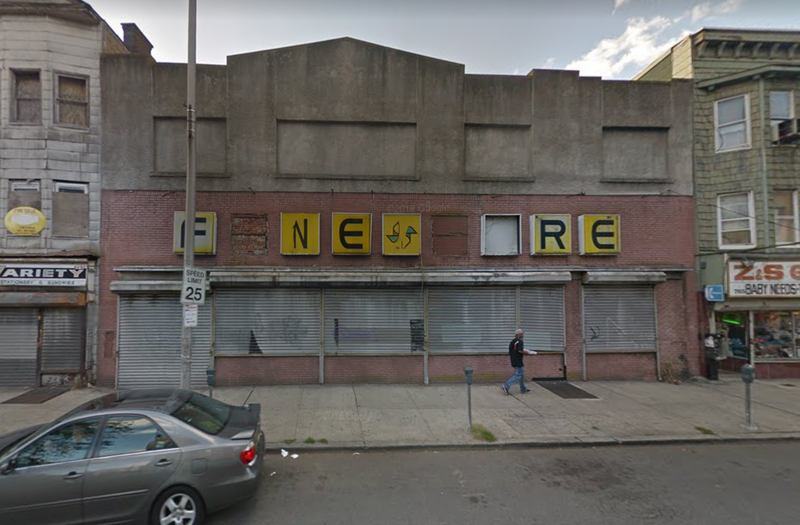 It has been significantly revitalized recently, especially near the Fine Fare, but who knows if Fine Fare caused it or is simply evidence of the trend. The Fine Fare stands out from its neighboring buildings because it's one-story in this fairly urban neighborhood. It looks very nice, and I hope to return to get interior photos sometime. The former building of the Fraternal Order of Eagles in Elizabeth, NJ has been repurposed with a nod to its past. The Eagle Supermarket opened with a freshly-painted eagle decorating the front of the building approximately in the 1980s and takes up the ground floor. You enter on the right side, leading to produce along the right-side wall. The store also has service deli and butcher counters along the back wall, plus a large hot food bar and seating area to the left. It's in a separate room from the main supermarket. Eagle's original owner sold the store to his grandson in 2003, who operated the store with his wife. Maikel Martinez and Ana Lemes then sold the store again in 2006 before opening their new Eagle Supermarket in Roselle. 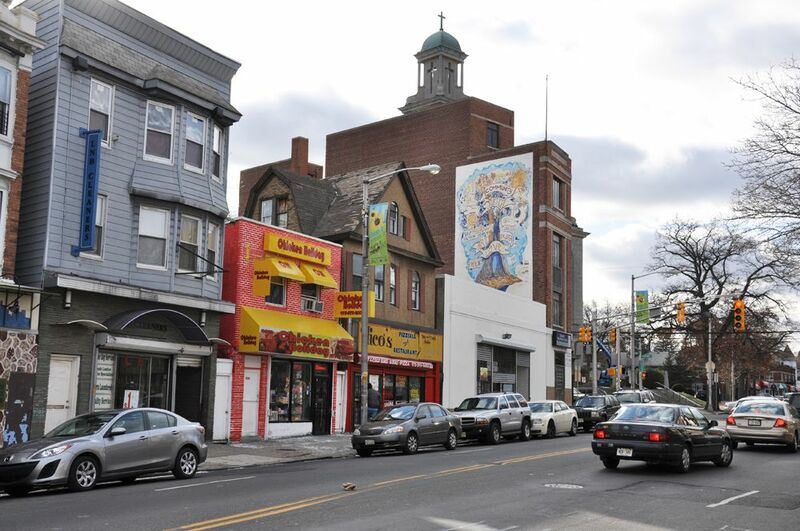 Martinez and Lemes returned to the city of Elizabeth in 2012 with the opening of their Superfood Marketplace on First St. 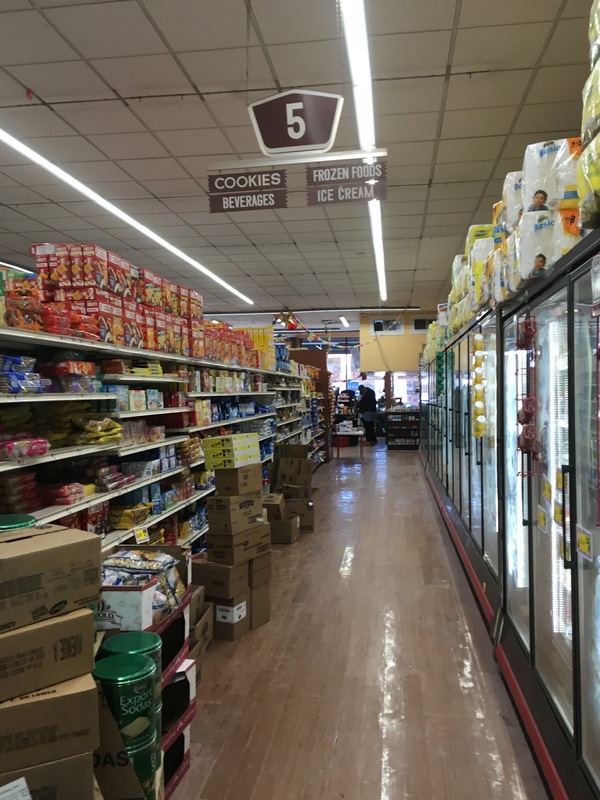 This supermarket is owned by the Universal Food Markets chain, which also owns the store of the same name in Rahway. This sign has been replaced with a more modern font than the corresponding "supermarket" sign to the right. The original entrance to the building has been permanently closed off. The eagle adorning the intricately-detailed door frame, however, not only remains but has been painted! Inside, the store is small but very complete and spotlessly clean. Despite the fact that it's a local store, the prices tend to be fairly reasonable. The lighting has all been replaced with new LED. 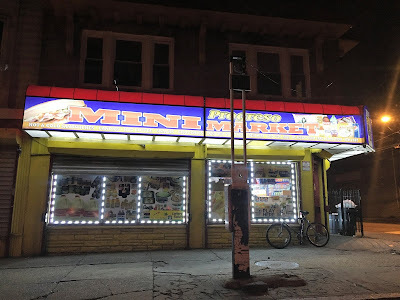 The store is located at 1102 Elizabeth Ave, Elizabeth, NJ. I love the sign on the right which says "3 Reasons to Buy Cheese Here" but does not list any of said reasons. Tour coming early October. We'll be looking inside this store in early October. Aside from the questionable paint job in this particular case, this store is really nice. Tour coming mid-October. In late October, we'll be touring this store, which is not a Super Fine Fare. Where'd you get that idea? And beginning in mid-November, we'll be attacking another neighborhood just like we did in Hudson County! Any guesses as to what's coming? If you guess correctly, congratulations! 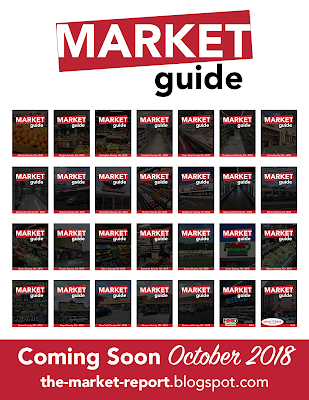 Your prize is the extension of your random supermarket knowledge -- and who doesn't want that?!?! Just west of yesterday's Progreso Mini Market is the Regio Supermarket at 749 South Orange Ave. Like Progreso, Regio sells Krasdale brand products. The name change has the unfortunate side effect of the complete illegibility of both names at night, when the sign is lit up. The poster in the rightmost window, with two red stripes, advertises Krasdale brand items. According to the exterior sign, this store has produce, meat, deli/sandwiches, and frozen foods. However, the selection of each of those must be pretty small because the store itself is quite small. And for anyone who might question my tag of "Corner Grocers" for this post -- Corner Grocers don't have to be on a corner. Because I said so. So there. 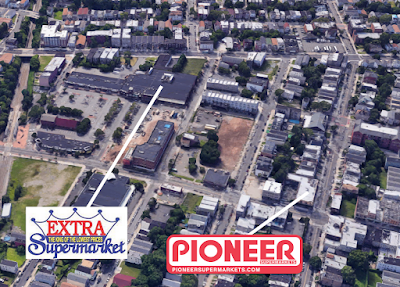 Just down the street from Extra Supermarket in Jersey City is a much smaller supermarket. 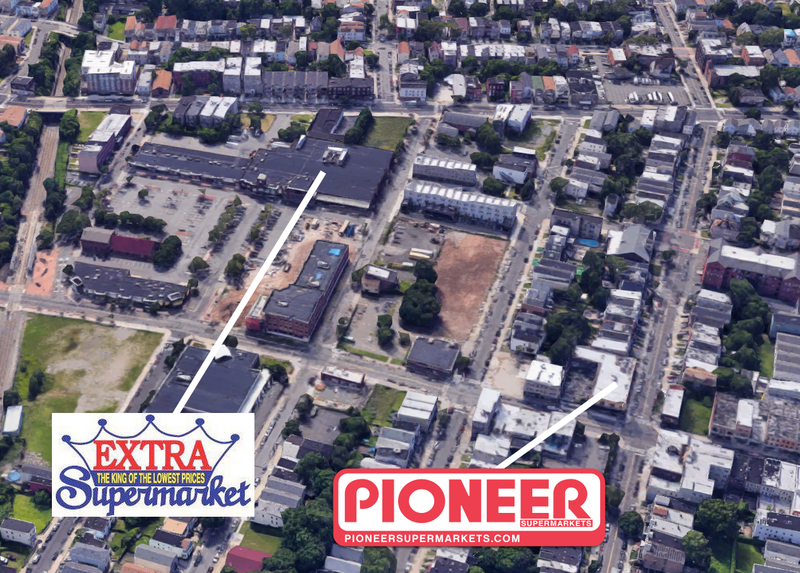 It's part of the Port Washington, NY-based Associated Supermarket Group and runs under the banner Pioneer Supermarkets. As we'll see, Pioneer has obviously been a supermarket for quite some time. The earliest name I know for the store was Green Garden Supermarket, which (like CitiMarket that Extra replaced) was African American-owned, although it was later taken over by Hispanic owners who opened a C-Town in the building. Pioneer has been in business for more than ten years at this point and opened ca. 2006. However, as of writing, the circular still says "Formerly C-Town"! Probably to stay competitive with Extra, Pioneer has a private parking lot; however, it's located across the street. People roll their shopping carts across the crosswalk to the lot! The Pioneer is quite small. Produce and dairy line the right-side wall with meat along the back wall and frozen foods in the last aisle. The store doesn't have any service counters. If you go back to the Google Maps aerial view, you will notice in the back-left corner of the store a small extension, which contains mostly nonfood products. Let's head in and see the classic decor inside! At first glance, the store looks pretty up-to-date. Newly installed or refinished fake wood floors, newly painted walls, bright lighting. But upon closer inspection, we see that there are, in fact, some very old elements intact. The aisle markers, for instance, or the "met" (formerly "meat") sign along the back wall. Looking up towards the entrance. I'm not sure why some shelves were so empty -- whether that's a recurring problem or simply low stock on sale items (avocados) the day I visited. The service door to the left leads to the basement, where the backroom space is. 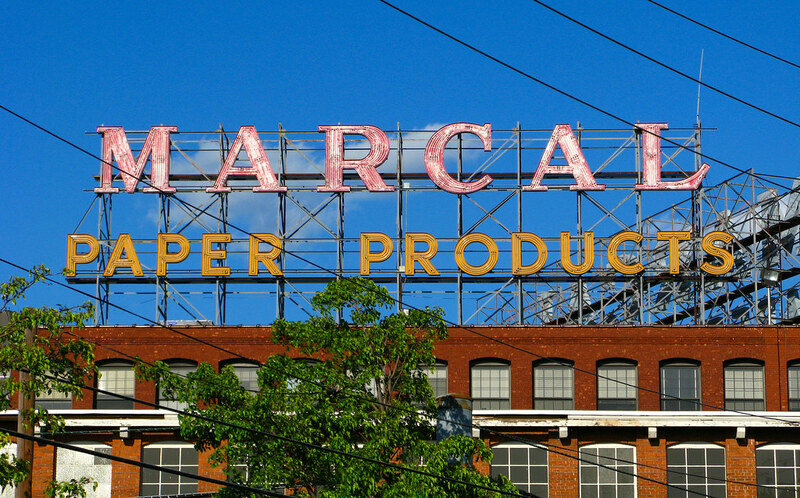 If you look behind the Marcal toilet paper (Marcal is based in Elmwood Park, NJ! ), you can see another similar deppartment sign for Produce. How old do you think the decor is? I would guess 1970s. Clearly it and the walls have been painted since. It looks like the panel where the C would be was never painted. If it ain't broke, don't fix it. If it is broke, stack toilet paper in front of it. Here you can see the entrance and exit doors. The windows do let in a lot of light, which is a very nice feature. Here's another great old sign, although this one is in better condition. 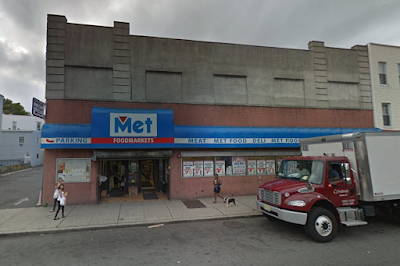 This store has a very similar feeling and appearance to the Met Foods in Guttenberg, also an ASG store, although this Pioneer is a little less rundown. Even though the decor is in worse condition! But wait, it's not a Met Foods. Meat lines the back wall. 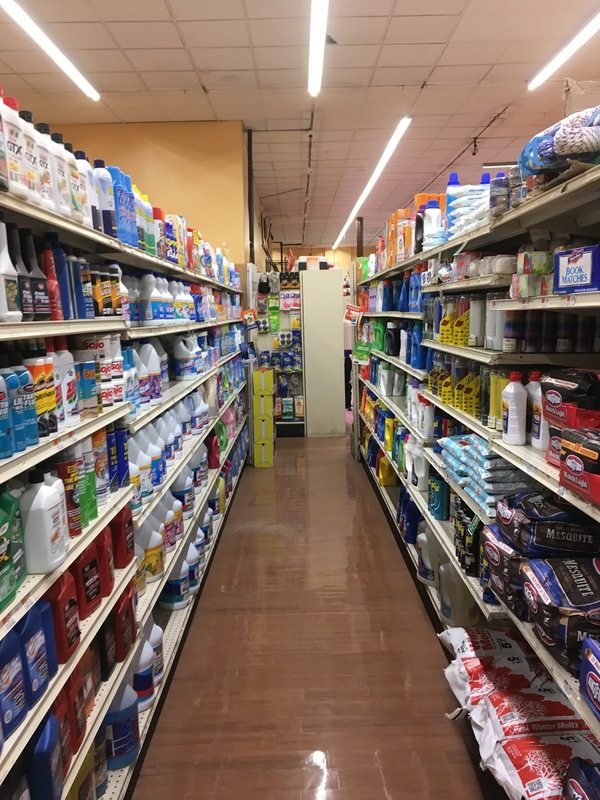 Although the selection was pretty good for a neighborhood store, the organization was inconsistent at best. Canned beans were in at least three different places around the store, which is hard to do because there aren't all that many places to put canned beans! Closeup on the aisle markers. Notice that the hanging category markers actually have ragged edges, like broken wood (or at least that's probably the effect they were going for in the 70s). Also, this aisle contains neither paper plates nor soft drinks. More empty shelves on the right here in aisle 4. Some of the hanging category markers have been changed over time or maybe added later. The same aisle, looking up towards the front. Looking back along the back wall, meat department. Here we can see the extension along the back wall. The last aisle of the grocery store actually continues to the left just around the corner from the Entenmann's display. Heading into the extension area. The wall to the left is the front wall of the extension. A bit of storebrand trouble here in nonfoods. The second of three short aisles in the extension. 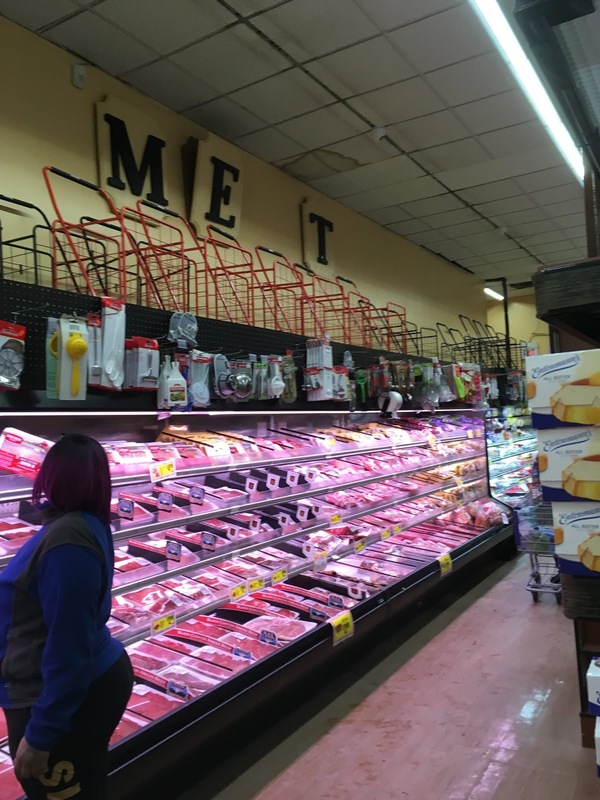 You can see where the meat department continues straight ahead in this photo. Back wall to the right and side wall straight ahead. I'm not sure what that built-out section is straight ahead, but it's not open to the sales floor. Looks like a storage area for the supermarket. Returning to the main sales floor for a look down the last aisle, which contains frozen foods (but no beverages, of course). Customer service is located under the manager's office in the front of the store. Kind of hard to read "frozen foods", but given the decor's condition, that's not a bad thing. On the other hand, the freezer cases look very new. This Pioneer is nice, but a little shabby. The decor is pretty cool though! Any idea when it's from or even if it's from a different store?